Bosco Wong (黃宗澤) reacted with nothing but joy when he was asked to comment on ex-girlfriend Myolie Wu’s (胡杏兒) exciting baby news. Myolie, who Bosco split with in 2012, announced on Mother’s Day that she is expecting her first child with husband Philip Lee (李乘德). At a blessing ceremony for his new television web drama Flying Tiger <飛虎極戰>, Bosco immediately responded with joy when he was asked to comment on Myolie’s baby news. Flying Tiger, a collaboration between Hong Kong’s Shaw Brothers and China’s Youku, also stars Michael Miu (苗僑偉), Ron Ng (吳卓羲), Eddie Cheung (張兆輝), Michael Wong (王敏德), Hugo Ng (吳岱融), Christine Ng (伍詠薇), Venus Wong (王敏奕), Grace Chan (陳凱琳), Mandy Wong (黃智雯), Samantha Ko (高海寧), and Oscar Leung (梁烈唯). It is Bosco’s first drama with Ron in over ten years. 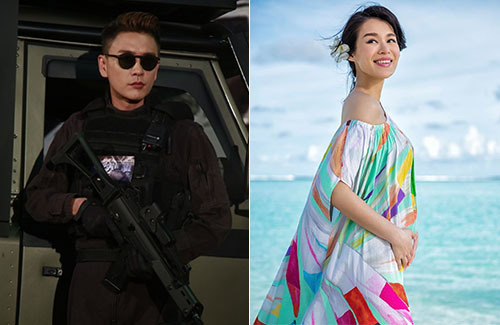 Both playing SDU paramilitary officers, Bosco and Ron said they have been working out together, but haven’t yet achieved that ideal “mermaid line” (V-cut) yet.